Zimbabwe National Liberation War Veterans Association Chairman Christopher Mutsvangwa (file photo). 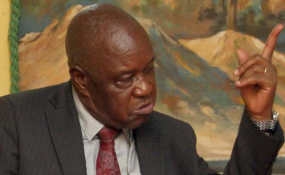 Outspoken Zimbabwe war veterans' association chair, Chris Mutsvangwa has slammed government and the central bank for cherry-picking local firms to favour with scarce foreign currency allocation at the expense of the rest. Mutsvangwa said the controversial "forex allocation economy" has contributed to the current economic crisis in the country. "It has failed and must be dumped in the dust bin," he told journalists in Harare Wednesday. He added, "The forex allocation system had been used by the previous government where certain few individuals get allocated hard currency which they would not have worked for by the Reserve Bank of Zimbabwe (RBZ)." The former Zimbabwe ambassador to China also said it was sad that tobacco farmers and artisanal miners' activities brought forex into the country but the particular groups remained wallowing in poverty after their money often got redirected to other sectors of the economy. "Tobacco farmers and gold panners are the major suppliers of hard currency in this country, but they are not enjoying the rewards of their hard work because it is taken from them and allocated to few individuals," Mutsvangwa said. "They continue to wallow in the circle of poverty; they never get any better year after year. "RBZ must not expropriate their money and give it to somebody else. Why take their millions of dollars and give them bond notes. "In my opinion, those who work hard in the country and earn hard cash should be allowed to enjoy it."